With blueberries in season, I thought I’d bump up a recipe we really enjoyed a few years ago. 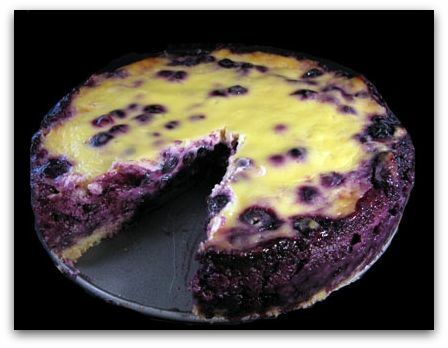 Originally titled Nova Scotia Blueberry Cream Cake, this blueberry sour cream tart is more like a cheesecake than a blueberry pie, but instead of cream cheese, it’s held together by mixture of sour cream, sugar, whipped cream and egg yolks. If you’re looking for something interesting to do with blueberries, this is it! You do have to be a sour cream fan, though. Originally called Nova Scotia Blueberry Cream Cake, this is a cross between a blueberry tart and a creamy blueberry pie. It is baked in a springform pan. Preheat oven to 375 degrees F. Spray a 9 inch round springform pan with cooking spray. In a bowl or food processor, combine flour, 1/2 cup granulated sugar, baking powder and salt. Cut or process in butter until mixture resembles coarse crumbs. Stir or process in the egg and 1 teaspoon of vanilla. Pat lightly into the bottom of the prepared pan. Sprinkle cornstarch over the blueberries and gently stir to coat (it will disappear as you stir). Spread the blueberries over the crust. Stir sour cream, 1/2 cup of sugar, egg yolks and 1 teaspoon of vanilla together in a mixing bowl. Pour this mixture over the blueberries and carefully spread it across the top. Set the springform pan on a foil lined rimmed cookie sheet** and bake for 60 to 70 minutes in the preheated oven, until the top is lightly browned around edges – it should still look a little loose in the center and will set as it cools and chills. Loosen hot cake from pan with a knife, but do not remove sides quite yet. Cool completely and chill for a few hours. Remove sides of springform pan. Serve each slice with whipped cream or spread whipped cream over entire cake before slicing. The foil on the cookie sheet is to catch drips and protect sheets. I’ve made this before and also posted it. Very different and worth making! Sounds pretty good!! Do you think you could use greek yogurt instead of sour cream? That’d make it a lot lighter but I’m not sure it has the structure. I have made this many times. It is one of our favorite summer desserts. Thanks for reminding me of it. I will be making it soon! Anything with blueberries goes immediately on my list! Looks delish! Mmm I love berries with tart dairy products. Can’t believe all that color from the blueberries =D. Looks unique and delicious! Wow, this looks great!! What a great and different use of blueberries–I love sour cream…can’t wait to try this one! This looks rather sinful! i have 4 quarts of blueberries and some sour cream…only thing I’m missing is the springform pan.